Kids’ clubs have come a long way since I was a little bambino. When I was a kid, I used a cut down nine iron. This is not a good idea today because when you cut down a regular adult shaft you make it even stiffer, and this makes it tough to swing. We’re lucky because the technology of today has made it a lot easier for our kids to pick up this difficult sport. 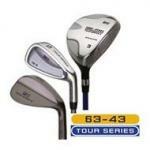 The main thing to consider when you are choosing golf clubs for your child is the length. It’s kind of like buying shoes, you want the clubs to fit your junior but you’d like a little room for him or her to grow. The Inch Rule – It’s ideal if your child has to choke down on the golf club about an inch, but no more. If he is choking down an inch and a half to two inches – that is too much and it will cause him to alter his swing. An inch is just perfect. I’d recommend that you buy junior clubs that your child feels comfortable choking down about an inch. This will fit your junior the best while providing room for him to grow. The next thing to consider is the shaft flex and weight. Just like adults, the flex and weight will correspond to individual swing speeds. For beginners, you should buy graphite shafts that are ultra light. 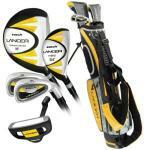 I like this US Kids Junior Golf Club Set Ultra Light Green for first timers. As your junior advances and becomes more consistent his swing speed will increase and you will need to go up a level. 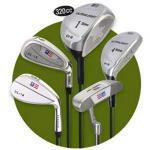 For the advanced golfer I recommend this US Kids Junior Golf Clubs, Tour Series Set of 10 w/ Driver. Here's a set of golf clubs for your little golf prodigy. These are from the US Kids Golf Tour Series. 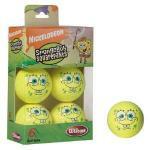 They are designed for more advanced children who have been playing golf and have a higher swing speed than the beginner. So it's time to get the bambino (or bambi-nette) a set of golf clubs. This is a pretty snazzy beginner set. This set of US Kids 2008 has five golf clubs including a driver and a putter. This is a great tool to help improve your golf swing. The Medicus Junior's Dual Hinged Jumbo Driver has a dual hinge that will break unless you swing the club back smoothly and continue to have consistent tempo throughout your follow through. Here's a seven club starter kit for your teenager. 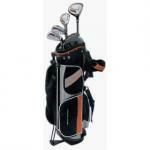 It comes with a 430 cc driver, an 18 degree 3 wood, a hybrid wood, 3 irons, a putter, and a backpack-style stand bag. This set is ideal for teens with the height range of 5'1" - 5'7". Let's get this over with. Look at the picture... All together now. "Awwwwwwwwwwww!" It's Kenny's first pull cart. How sweet! It won't be long before he'll be out on the course chunking shots and throwing his clubs just like the grownups. Ah, kids' clubs. The young whipper- snapper wants to play golf like the old man, eh? Step on up, my son. Let's shop for some clubs.